Hi, it's Jill. We're busy getting ready for Halloween here in South Cove. We might not have the chilly nights or the frost on the pumpkin, but we do have a lot of Halloween traditions. The store has an annual trick or treat party for our younger readers. And usually, we're the last stop after the monsters and ghouls have gathered all the candy from local businesses. Even Josh gets into the spirit and decorates one of his display windows with a halloween scene. Of course, he lets his assistant, Kyle, give out the candy. Josh and kids just don't get along. This year we have a witching hour theme thanks to Darla Jones, our city marketing maven. Of course, like most jobs in South Cove, it's very, very part time pay for full time hours. But she doesn't seem to mind, and she's great at it. Decorating the store has me remembering the weekend a few years ago when a few of us spent the weekend at Maryanne Demerit's house before it was demolished for a new condo development. Now, don't get me wrong, I'm not saying Maryanne was a witch, but there were a lot of strange things that happened that weekend. I'm pretty sure the story has been told, maybe in A Deadly Brew. Lynn hangs around my coffee shop a lot, looking for stories to write about. One of these days I'm going to ask for my cut of her royalties. It's only fair, right? Better go and help Aunt Jackie with the witches cauldron. Dry ice is tricky. See you at the party. 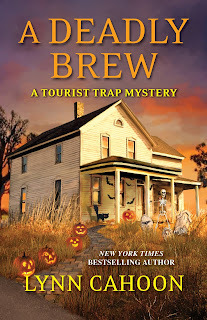 Lynn Cahoon is the author of the NYT and USA Today best-selling Tourist Trap cozy mystery series. 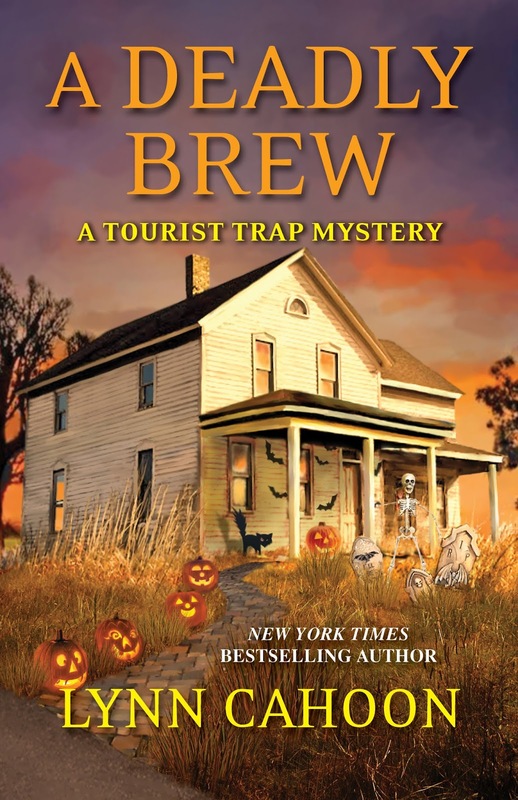 GUIDEBOOK TO MURDER, book 1 of the series, winner of the Reader's Crown for Mystery Fiction. She also pens the Cat Latimer series available in mass market paperback with SLAY IN CHARACTER coming in late 2018. WHO MOVED MY GOAT CHEESE and KILLER GREEN TOMATOES are 2018's additions to the Farm-to-Fork series. I bet the trick or treat party is fun for the kids & adults. Looking forward to hearing how the trick or treat party goes.